Sitting on a train to Glasgow where I'm going to see Nick Cave and the Bad Seeds. And I'm listening to Johnny Dowd's new album, A Drunkard's Masterpiece. I don't know about the drunkard bit, but as far as the mercurial Dowd is concerned, "masterpiece" works for me. Dowd is an extraordinary character. His life story sounds like a Chuck Berry song. He was born 60 years ago in Fort Worth, Texas; brought up in Memphis, Tennessee and elsewhere; served time in the US Army; and eventually settled in Ithaca, New York, where he set up a furniture removal business and lives to this day. He didn't get around to releasing his first album until he had almost turned 50, but has been making up for lost time ever since. My favourite on this new one is called Unintended Consequences. It's got a really funky organ and guitar riff going on, and then Dowd launches into this kind of beat-poet rap. "Unintended consequences crawl forth like demons from the netherworld..." he drawls ominously, as the bass stabs and the organ surges. "I'm not Fred Astaire nor am I Ginger Rogers," he states firmly, in case we were wondering. Be that as it may, the man knows how to swing. Did I mention that we're playing with Dowd at Dingwalls on Thursday May 8? Yessiree! A very special night for us - and everyone, I hope. 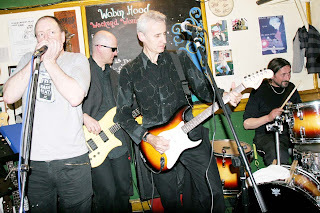 Talking of which, we had a great time at The Robin Hood in Guildford last week with Pete Sargeant's Band Of Sceptics and Torin Brown. The gig is tiny, but perfectly formed and there was a great atmosphere. Towards the end of the evening Pete in particular was clearly overtaken by the mood of the moment. Leaping up without any prior consultation, he commandeered one of the mikes and added 12 blueswailing bars of harmonica to Eight Rounds Later. He'd picked the right key, which was a relief, and we all thought it sounded trés cool. Pictorial evidence (above) courtesy of Marilyn Kingwill. And so to the Cavendish Arms in Stockwell on Friday. The stage was straight out of Twin Peaks: red drapes, wooden boards - everything except the dancing dwarf. And the dressing room even included a row of holders along the wall on which to hang up our guitars! Shirley, who runs the place, used to play in a band herself, and when she got her own venue, she resolved to design exactly the sort of gig she would have wished to encounter when she was a musician herself. And that is just what she has done. It was a varied bill, including an unusual ukelele player called Ben and an alt.blues-rock band with a frontman who had checked into a zone somewhere between Mick Jagger and Jaz Coleman - and that was in the sound check! We closed out the night with a set which we turned on its head; started with Going to do Something and worked backwards. Felt good. We might do something similar for our gig with Johnny Dowd. And if Johnny wants to jump up and contribute an ad lib harmonica break or maybe a tap dancing routine to our set - well, he is very welcome.